Happy Comic Release Day! Welcome to another installment of GeekMom Comic Book Corner, where we recap our adventures in comics for the week. This week we look at Batman: Li’l Gotham #7 and Star Wars #3 . 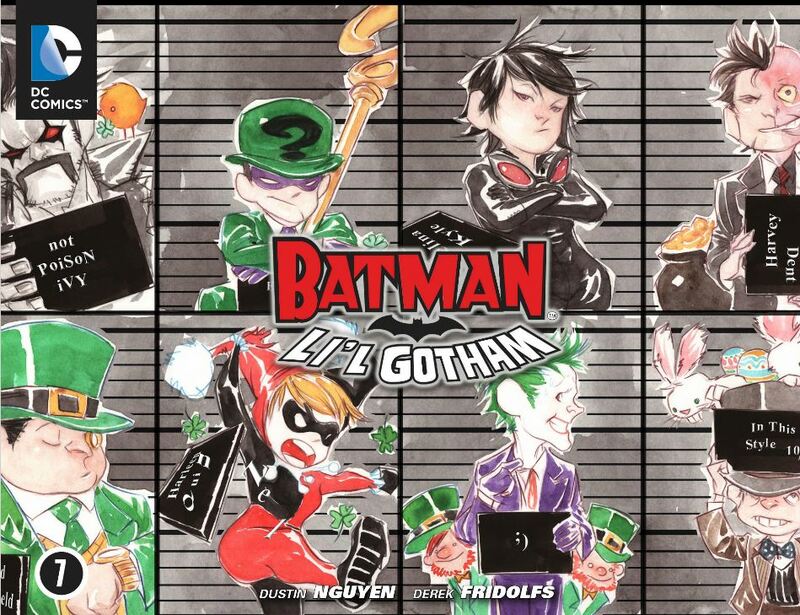 Batman: Li’l Gotham #7 (written by Derek Fridolfs, Dustin Nguyen; art by Dustin Nguyen) features a St. Patrick’s Day themed riddle. Someone is robbing banks in Gotham and blaming “innocent” villains for the crime. While the Bat family goes around Gotham picking up clues to who robbed each bank, the real villain is living it up in style at the expense of everyone else. Don’t worry…Batman gives the others a chance at getting him back for his games. Oh and did you know that the Batmobile has a backseat and you can squeeze six villains into it? The part I loved the most about this one, is how many characters they were able to squeeze in to this one issue. Just on the good guys’ side, I counted eight heroes (including Gordon and Bullock). The bad guys had about seven on their team, that is until they went after one of their own for framing them. Batman: Li’l Gotham is a digital only series released around a holiday in each month. Check it out on ComiXology! Just when I think I can’t like this series more, writer Brian Wood comes up with something else to make me grin with glee. Star Wars #3 , with another striking cover by Alex Ross and art from Carlos D’Anda that pops off the page, immediately kicks off the action as Han Solo tries to get himself out of an ambush on Coruscant. Brian Wood captures the defiant spirit of Han Solo perfectly in this issue. Han trusts his gut and yes, he does have a bad feeling about this. Meanwhile, Princess Leia finds herself clashing with Luke Skywalker. It’s easy to forget that Luke is still young and fresh off the moisture farm after the end of A New Hope , and this issue shows a little bit of cockiness in the boy who destroyed a Death Star. It’s a side to Luke that I hadn’t considered before, and I continue to be impressed with the depth Brian Wood is already giving to characters who we all know and love. Wood recently confirmed on Twitter that he’s in this series for the long haul, which is great news for Star Wars fans. Corrina– Batman and Robin #18 written by Pete Tomasi, art by Patrick Gleason and Mick Gray. This week’s issue of the comic is a requiem for Robin, Damian Wayne, who died last week in Batman Incorporated. I’m not fond of the killing of kids in comics but I wanted to draw attention to this issue because it’s completely without words. It’s rare for a silent issue to be published, especially by Marvel or DC, and the preview linked above shows how the art alone can have emotional impact. If you’ve been keeping up with the latest SWSX news (or you’ve tried to get on ComiXology the past three days), you know that Marvel is giving away 700 free first issues. The fans response to promotion caused some serious traffic on ComiXology’s website and apps to the point that they have had to pause the promotion to allow regular traffic back on their site. That doesn’t mean fans won’t get their comics though. According to ComiXology’s website, they are only pausing the promotion until their systems can catch up with the demand and traffic that the fans are bringing. To stay up to date on the promotion and when it will be available again, head over to ComiXology’s website and sign up for alerts.